Annette Görtz clothing is both structural and clean in neutral colors. The form is the focus, with clean cuts and shape; yet, it is not one dimensional. The Annette Görtz black cotton/linen jacket has a subtle architectural a-line silhouette, with a slight stretch. The non-obstructive tones means bringing together other pieces in the collection creates a cohesive yet interchangeable look. 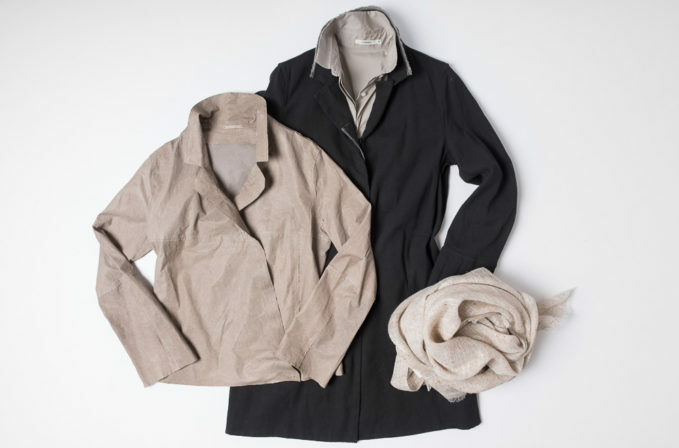 Worn over a grey Lareida shirt, it can be switched with a taupe grey jacket by Annette Görtz and finished with a scarf.